A working group of representatives of the interior and finance ministries will be set up to make an assessment of the legislation in the field of penalties for traders violating the law upon the trade in excise goods within the next three months, BTA reports. Interior Minister Roumen Petkov said this at an open meeting of the Commission for the Prevention and Countering of Corruption held on Wednesday. The meeting was on: Measures for the Prevention and Countering of Smuggling and Corruption - Effective Protection of Public Interests and Lawful Business. Attending were Finance Minister Plamen Oresharski, State Administration and Administrative Reform Minister Nikolai Vassilev, diplomats of the embassies of EU member states, representatives if the European Commission's permanent representation to Bulgaria and of the media. Since the beginning of 2008 policemen have seized a total of 130,000 cigarette packs without excise duty stamps, over 11,000 sport outfits and other goods of the value of 1,398,170 euro and some 200,000 US dollars. Last year the number of citizens' reports for cases of corruption exceed 2,300, Petkov said. Efforts for the introduction of an integral card payment system at all land checkpoints at the external EU border continue, State Administration Minister Vassilev said. This project is expected to be completed within two months, he added. The corruption affects everyone, said Willem van Ee, Ambassador of the Netherlands in Sofia. "We have fears that illegal trade and smuggling persist in Bulgaria and this is why it was important to hear Minister Petkov saying that serious steps are being taken to this end," he stated adding that he is impressed with what Bulgaria has achieved so far. The closure of the duty free shops is an important step in the right direction but it is also important to pay attention to the application of the law, said Gudrun Steinaker of the German Embassy in Sofia. 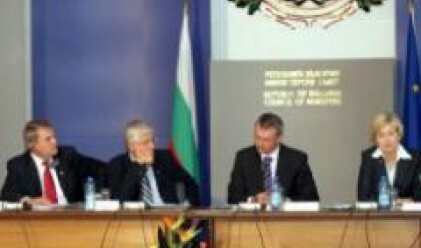 "We insist to see offenders sentenced because this is important for the Bulgarian public," she added.